Before I start up on today’s topic, I wanted to update you all on my humility lesson (check out yesterday’s post). So far life has not changed, but I have. Yesterday I prayed not only for peace and perseverance, but for the ability to erase all these worries from my mind – even if just for 30 minutes. I spent the day tending to my daughter which at first was not easy because she was miserable in pain and I was miserable in life. Somehow I found peace about midway through the day. We spent the evening watching “The Help” which reminded me of how anger and hatred can do an intense amount of evil to others. So all in all, I am working on my humility. I am trying to catch the subtle signs with the sledgehammer signs. It is a process. Recently, I heard someone compare the Holy Spirit to dew point. I was struggling with the image, so of course I came home and “googled” dewpoint. Dew point is the temperature below which the water vapor in a volume of humid air at a given constant barometric pressure will condense into liquid water at the same rate at which it evaporates. 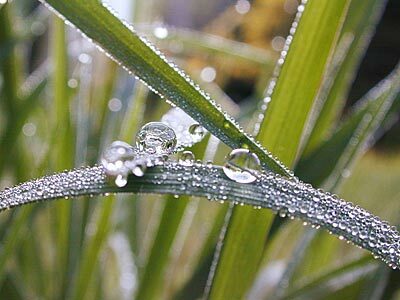 Condensed water is called dew when it forms on a solid surface. A little confusing right? Tell me about it – in college the only class that I should have failed (but the professor felt sorry for me) was weather. I couldn’t understand what in the world they were talking about. So in my humble terms (which remember is coming from someone with no weather experience whatsoever), is that when water vapor (which you cannot see) becomes liquid water (which you can see). All right I know it is simplistic, but I think it moves us toward the connection to the Holy Spirit. You see, the Holy Spirit resides in all of us. Some of us choose to let Him do His work, and some of us choose to ignore Him. When he becomes evident in our life, things start to change. Just like when water vapor becomes liquid water. All of the sudden, something that was unnoticeable and pushed aside, shows up in our life very clearly. Who knows what causes it to happen. Maybe it is a death in the family, maybe it is a sledgehammer to our heads (like my humility experience), or maybe it is a friend who happens to share their faith with us. Whatever it is – the Holy Spirit starts to move and appear out of no where. See the connection here – just like humidity in the air causing the water vapor to appear, something in our life causes the Holy Spirit to become quite evident. The Holy Spirit is our guide. He will help us when we are down and out. He will guide us back to God’s path, but the key is – we have to allow Him to do so. We have to find a way to make the Holy Spirit appear in our life. Trust me the Holy Spirit comes and goes in mine. Sometimes I push Him back and other times (like today), I am screaming for His help. Psalm 51:10-12 Create in me a clean heart, O God, And renew a steadfast spirit within me. Do not cast me away from Your presence and do not take Your Holy Spirit from me. Restore to me the joy of Your salvation and sustain me with a willing spirit. So you can see, the Holy Spirit can be found throughout the scriptures. He is present. He can be invisible or visible – it is your choice. You can push Him aside or lift Him high. You can wallow in your misery or find joy through the Holy Spirit. You can complain, argue, and cut people down in life OR you can find the good, negotiate and lift people up in life. Let your air vapor become liquid water. Make the Holy Spirit come alive within you and share Him with others by your words and actions. This entry was posted in Faith, Family, God, Jesus, Religion, Social Justice, Uncategorized, Women and Christianity and tagged dew point, Faith, hatred, Holy Spirit, invisible God, joy, love, misery, visible God. Bookmark the permalink. This is a powerful image! I like it! Good question. That is my blog topic today. By the way… very creative analogy. I like it.